News Corp. chairman &amp; CEO Rupert Murdoch. Photo: Bloomberg. London/New York: Rupert Murdoch’s News Corp. (NWSA), rocked by a phone-hacking scandal at one of its London newspapers, may face questions about computer hacking too, according to a British lawmaker at the company’s annual meeting on Friday. Tom Watson, a Labour lawmaker, said British police are looking into at least three private investigators who have done work for News Corp. newspapers, in addition to Glenn Mulcaire, who was arrested in the phone-hacking scandal. At least one of those investigators was breaking into computers, he said. News Corp. chairman & CEO Rupert Murdoch. Photo: Bloomberg. Murdoch, chairman and chief executive officer, said he wasn’t aware of computer hacking in the UK and told shareholders News Corp. would investigate any issues. “These rumours you speak of are being addressed," Murdoch said at the meeting in Los Angeles. “We will put this right." Murdoch, 80, jousted with shareholders at the gathering, parrying charges of lax oversight and employing wit as he sought to disarm critics. He ended the meeting without reporting the results of a board election and a shareholder bid to split the CEO and chairman’s roles. The company later reported that all directors had been elected, and the proposal to split the chairman and CEO roles wasn’t approved. It said it will provide specific vote tallies next week. Teri Everett, a spokeswoman for News Corp., didn’t return e-mails and a phone call seeking additional comment. 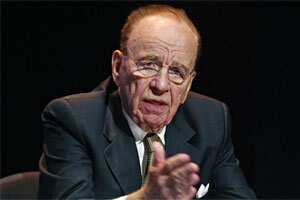 Watson also questioned Murdoch about the involvement of News Corp. employees with private investigator Jonathan Rees. Rees did work for News International, the UK newspaper unit, including at least 500 investigations, Watson said in an interview before the meeting. Murdoch responded, without specifying Rees, that some of the things that happened years ago were “absolutely wrong" and that the company was cooperating with police investigations. During the meeting, Murdoch said News Corp. was performing well in news, entertainment, sports and digital programming. Still, the company must focus on more than finances, he said. “We cannot just be a profitable company, we must be a principled company," he said. “There are real issues that we must confront and are confronting. We could not taking this more seriously." The 168-year-old News of the World was closed in July after admitting it had hacked the phone of murdered schoolgirl Milly Dowler. News Corp.’s UK unit on Sunday agreed to pay £3 million to settle claims by the family of Dowler, who was killed in 2002. The scandal has led to at least 16 arrests, including former company executives. News Corp. may be liable for “way, way, way more" than the £20 million it has set aside to settle the cases, Watson said in an interview with Bloomberg Television on Sunday. Watson went straight from a hearing on phone-hacking in Parliament in London to the airport for a flight to Los Angeles.